As with the public rooms, the Royal Family's private quarters on Britannia were not grand and majestic. Rather, they were comfortable and homey. 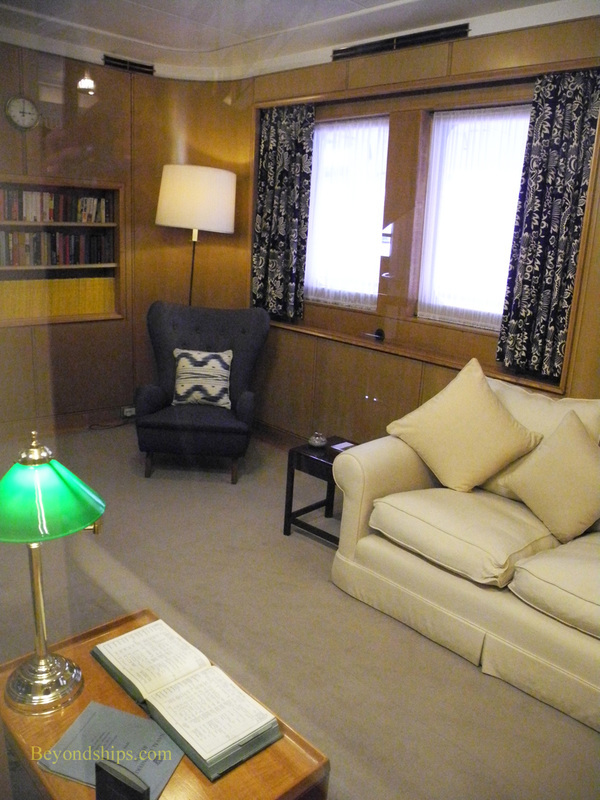 The Queen's modestly-sized bedroom on the starboard side of shelter deck has light wood furniture with floral designs on the curtains, chairs and bed. There is also a large floral embroidery over the bed. Adjacent to the Queen's bedroom is the Duke of Edinburgh's bedroom. With its dark wood furniture and dark burgundy fabrics, it has a more masculine feel. Both the Duke's bedroom and the Queen's have their own bathrooms. 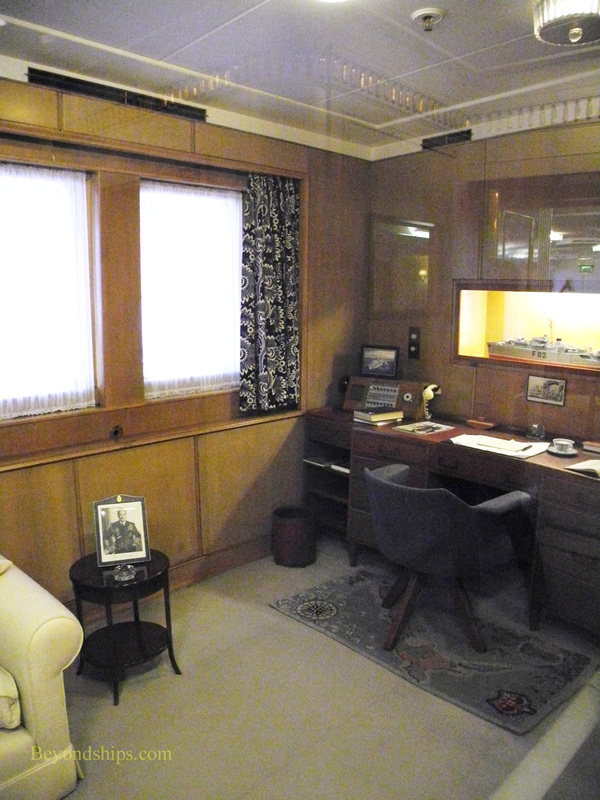 On the port side of Shelter Deck are two additional bedrooms, which were used by other members of the Royal Family. However, neither of these rooms was dedicated to a particular individual's use. 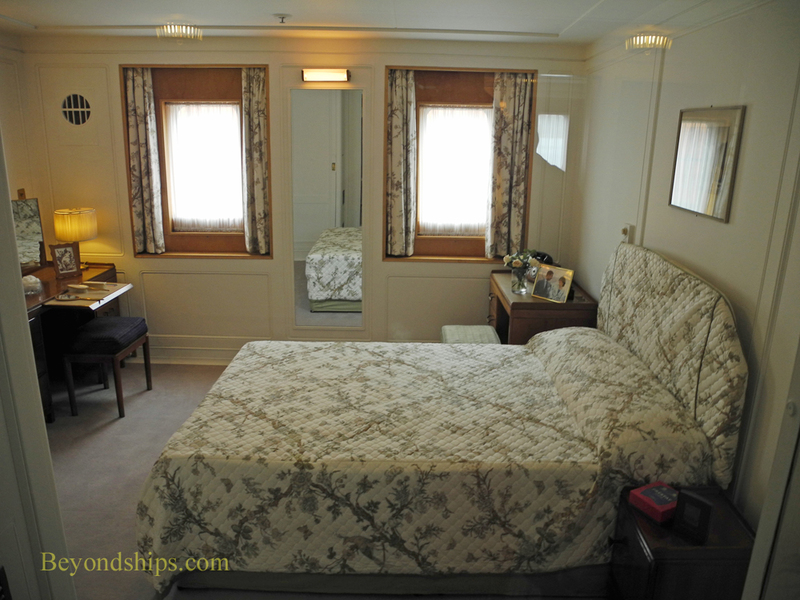 One of these bedrooms has the only double bed aboard Britannia. 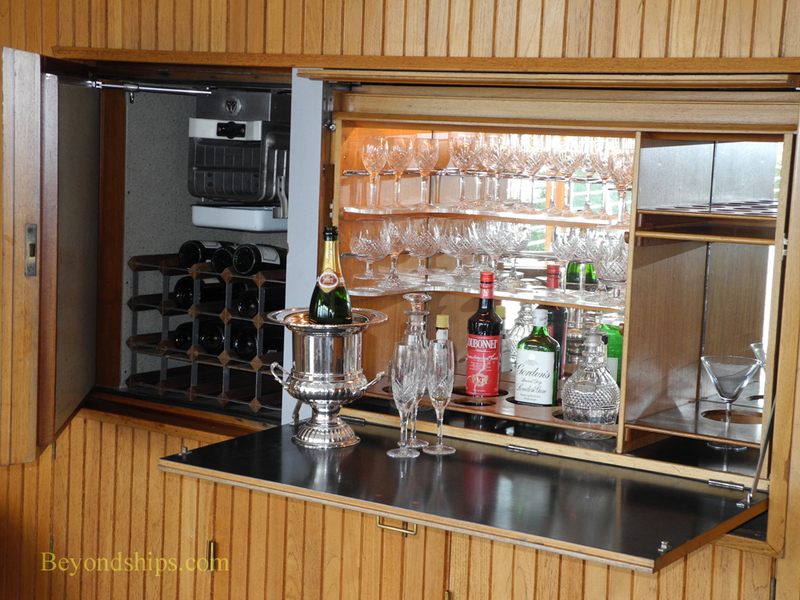 It was used by the four couples who honeymooned on Britannia - - Princess Margret and Anthony Armstrong Jones; Princess Anne and Mark Phillips; Prince Charles and Princess Diana; Prince Andrew and the Duchess of York. There are 16 other bedrooms located elsehwere on Britannia, which were used by the Royal Family and dignitaries such as President Clinton and Mrs. Clinton. Done in much the same style as the Queen's bedroom is the Queen's Sitting Room one deck below on Upper Deck. This room functioned as the Queen's office where she could work on the various state papers that were delivered to her each day. 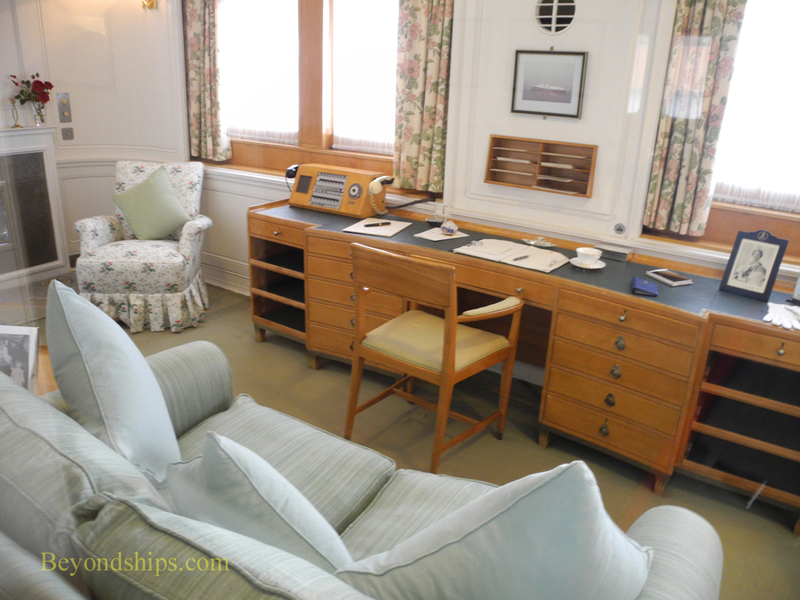 In the corresponding location on the port side of Upper Deck is Prince Phillip's teak-paneled private space. Over the desk, is a model of HMS Magpie, which Prince Phillip once commanded. This informal room was reportedly the Queen's favorite. It was used for afternoon tea and has its own bar for cocktails. 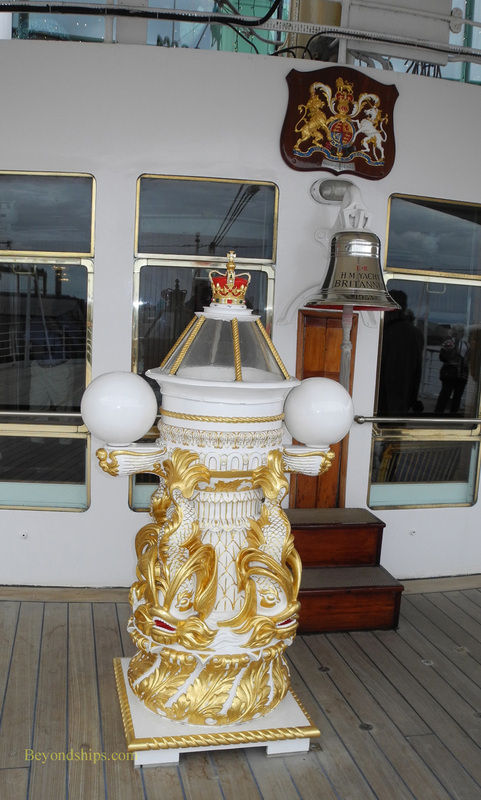 Above: One of the attractions of Verandah Deck is the large binnacle, which was once on Queen Victoria's yacht Royal George. Just outside of the Sun Lounge is a large expanse of open deck. Here, a collapsible swimming pool could be set up (Britannia has no permanent pool). Alternatively, members of the Royal Family could use this area for outdoor activities. When the weather was right, official functions were also held here.